Definition at line 24 of file CBitPatternTreeNode.h. Definition at line 19 of file CBitPatternTreeNode.cpp. Definition at line 28 of file CBitPatternTreeNode.cpp. 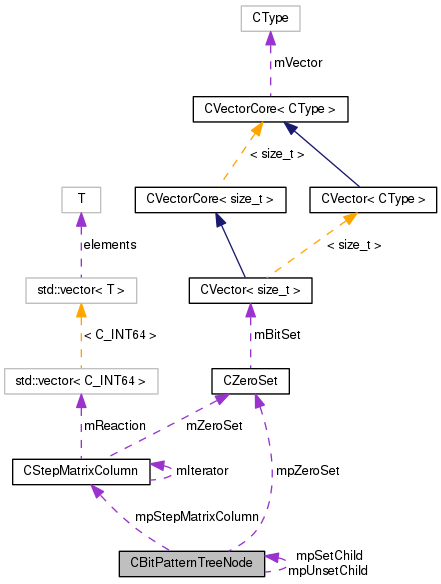 References CStepMatrixColumn::getZeroSet(), mpStepMatrixColumn, mpZeroSet, and splitPatterns(). 48 // This should never happen. 61 // This should never happen. 71 // This should never happen. Definition at line 101 of file CBitPatternTreeNode.cpp. References mpSetChild, mpUnsetChild, mpZeroSet, and pdelete. Definition at line 170 of file CBitPatternTreeNode.cpp. References getChildrenCount(), mpSetChild, mpStepMatrixColumn, and mpUnsetChild. Referenced by getChildrenCount(), and CBitPatternTree::size(). Definition at line 73 of file CBitPatternTreeNode.h. Definition at line 108 of file CBitPatternTreeNode.cpp. Definition at line 68 of file CBitPatternTreeNode.h. Definition at line 63 of file CBitPatternTreeNode.h. Referenced by CBitPatternTreeMethod::combine(), and splitPatterns(). Definition at line 40 of file CBitPatternTreeNode.h. References hasSuperset(), mIgnoreCheck, mpSetChild, mpStepMatrixColumn, mpUnsetChild, and mpZeroSet. Referenced by hasSuperset(), and CBitPatternTree::isExtremeRay(). Definition at line 165 of file CBitPatternTreeNode.cpp. Definition at line 113 of file CBitPatternTreeNode.cpp. References CBitPatternTreeNode(), getZeroSet(), mIgnoreCheck, mIndex, mpSetChild, mpUnsetChild, mpZeroSet, and nextAvailableIndex(). Definition at line 91 of file CBitPatternTreeNode.h. Referenced by hasSuperset(), and splitPatterns(). Definition at line 87 of file CBitPatternTreeNode.h. Referenced by nextAvailableIndex(), and splitPatterns(). Definition at line 95 of file CBitPatternTreeNode.h. Referenced by getChildrenCount(), getSetChild(), hasSuperset(), splitPatterns(), and ~CBitPatternTreeNode(). Definition at line 97 of file CBitPatternTreeNode.h. Referenced by CBitPatternTreeNode(), getChildrenCount(), getStepMatrixColumn(), and hasSuperset(). Definition at line 93 of file CBitPatternTreeNode.h. Referenced by getChildrenCount(), getUnsetChild(), hasSuperset(), splitPatterns(), and ~CBitPatternTreeNode(). Definition at line 89 of file CBitPatternTreeNode.h. Referenced by CBitPatternTreeNode(), getZeroSet(), hasSuperset(), splitPatterns(), and ~CBitPatternTreeNode().